Provo High School Mormon Seminary Building. Photo by Ben McCune. 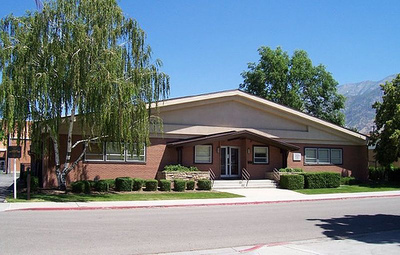 In The Church of Jesus Christ of Latter-day Saints, the Church Educational System (CES) provides a Seminary for high school age youth (usually 14 to 18). It is typically attended daily (Monday through Friday) and provides youth with instruction in the scriptures and in gospel principles. These courses are not for credit or degree purposes, for while Mormons encourage advanced learning in every field, a theological degree is not a requirement for a call to serve or preside in the kingdom of God. Friends of other faiths are also welcome to participate in seminary classes. Every year the curriculum focuses on one of the standard works of the Church; the Old Testament, the New Testament, the Book of Mormon, and the Doctrine and Covenants. Students attend seminary for four years, so that they are able to learn about all four books of scripture in-depth. Students are also asked to memorize twenty-five selected scriptures, known as Scripture Mastery verses, from the book of scripture being studied that year. Over the course of four years, a seminary student has had the opportunity to memorize 100 scripture verses. (Click on this link to learn more about Scripture Mastery verses.) The classes are free, and the Church Educational System provides manuals and student materials, except for scriptures. Released-time seminary is offered in areas where there are large populations of LDS students and where laws to do not forbid it. Seminary classes are attended during school hours in a Church-owned building near the school. The teachers are full-time and are employed by the Church Educational System. Students do not receive any school credit for taking seminary. Daily (formerly called Early-morning) seminary is available in most areas that have a smaller population of LDS youth. It is held each school day, most often before the normal school classes begin. Classes are often held in the local church building or at a member’s home, and are taught by volunteers. Home-study seminary is available in areas where daily or released-time seminary attendance is not possible, because it is either not offered, or because it is too far away. Youth in this type of seminary are provided with materials to help them study the scriptures daily. They then meet with a CES teacher for class once a week. All youth are encouraged to complete and graduate from seminary, if the opportunity is available to them. President Boyd K. Packer said, “Parents, encourage, even insist, that your students register for seminary or institute. Presidents, bishops, youth leaders, you are responsible to encourage every youngster, without exception, to enroll. Few things you do will benefit them quite as much” (Boyd K. Packer, “Agency and Control,” Ensign, May 1983, 66). After high school, the Church offers Institute classes for college-age young men and women across the country (often near major colleges and universities). This page was last edited on 28 October 2012, at 17:33.